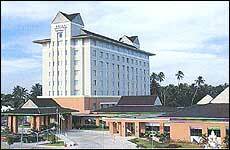 Royal Princess Narathiwat is a first class hotel situated in the heart of the city of Narathiwat. Narathiwat is another southernmost province of Thailand bordering on the Malaysian territory. This beautiful region has a unique southern character and culture with natives and many beautiful beach resorts. At Royal Princess Narathiwat, all 117 rooms and suites are equipped with international amenities. For business and leisure you will enjoy high standard of accommodation, friendly service and good value for money. A meeting room accommodating up to 600 persons and can be partitioned into smaller rooms.